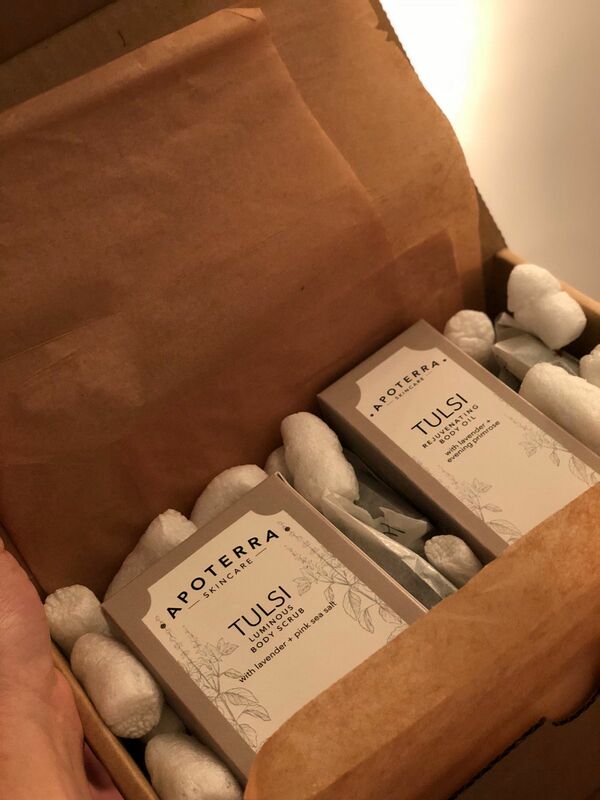 Our Tulsi line has a complex “spa-like” aroma with notes of lavender, cinnamon, sweet citrus, basil, vanilla, mint, clove, and nutmeg. It is a spiritually nourishing aroma that creates a sense of calm and balance. Tulsi, also known as the “Elixir of Life” because of its healing powers, provides calming or uplifting energies, whichever your soul desires. Lavender, a flower that needs little introduction, is balancing and soothing to the nervous system. This lightweight body oil glides on easily, delivering healthy essential fatty acids that replenish and rejuvenate your skin while engulfing your senses with a balancing aromatherapy experience. Sunflower oil, evening primrose and olive oil sink in deep, preventing transepidermal water loss, improving elasticity, and maintaining proper skin barrier function. This nutrient-rich body oil soothes the mind while simultaneously ensuring a healthy glow. Check out reviews of our body oil here. This non-messy pink sea salt scrub will properly exfoliate while simultaneously moisturizing your skin, leaving you feeling silky soft. Nutrient-rich pink sea salt delivers minerals and properly exfoliates. Deeply moisturizing plant oils of coconut and shea protect and moisturize without leaving skin feeling greasy. This relaxing scrub gently exfoliates, promotes healthy circulation, and deeply moisturizes, revealing the glowing, beautiful you. Check out review of our body scrub here. Il mio acquisto annuale,il migliore di tutti ,materie prime autentiche e aromaterapia eccellente,sarebbe il massimo se fossero rivenduti in Italia. ABSOLUTELY LOVE this product...I struggle with dry skin especially in the winter and after using this product for a week I have already stocked up for the upcoming winter months. My legs have never looked and felt SO GOOD!! Since using this product, my skin has been incredibly soft, a difficult feat as my skin is getting adjusted to New York winters! Such a treat for the shower! The scrub feels cleansing, yet leaves skin with a soft layer of moisture. I'm obsessed with the body oil as it leaves a beautiful gender neutral scent and a lovely glow!